Hey everybody this thread is to discuss your guns and what you shoot at. Lets keep this more about guns and less about hunting. My dad and i use several different guns for a couple of things. My dads-12 gauge 1187 for deer hunting with slug scope,12 gauge Benelli super black eagle, Semi-auto Rueger .22 cal with a factory scope, Savage arms bolt action .270, Savage 17 HMR. Mine- .44 mag six shooter with wood stock and 6" barrel, Savage arms bolt action .22, 12 gauge 870 for deer hunting(i use the 1187 for trap). I would really like to get a 45 ACP 1911. So what do you guys have? What do you like about them? What guns do you want? Last edited by dug_543; 04-23-2012 at 09:19 PM. Nice My buddy just got a franchi. Its stupid light and shoots like a dream........but costs as much as 5 37's. I have a Ruger 10/22 that I love to shoot paper with. I might try "small" game hunting with it this year. I got the TALO exclusive version with the stainless barrel and ATI folding stock. I understand there were only 2500 made of this model. I just picked up a Hi-Point 9MM carbine a few weeks ago. I have yet to shoot it yet, but from everyone I have heard from they are a blast to shoot. next purchase will be a 9MM handgun I think. I like the Ruger SR9. 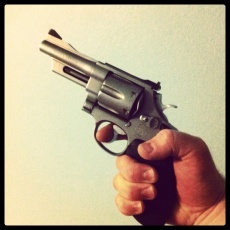 I plink with my Smith and Wesson MP15-22 and love it. Match grade barrell, identical to a M4. I've got 7 (25 round) mags for it, and a cheepie red dot thats got a 1 moa dot. I would love a tactical .22. My girlfriend needs a gun and its either a 9mm or a sig .22 or something. Any thoughts? I like the 22's because they are stupid cheap to shoot. here is a pic of my 10/22. 44 with hogue grip is awesome to shoot, but empties your wallet quick! 870 my favorite pump action. Got a 40XD for carry, love all. 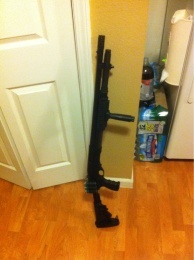 Going to use my tax return on another semi auto, any suggestions? as it sits, got a little over $400 into it. I think i am going to change the foregrip to a folding one so it fits into my case better. there are some out there for sale still. 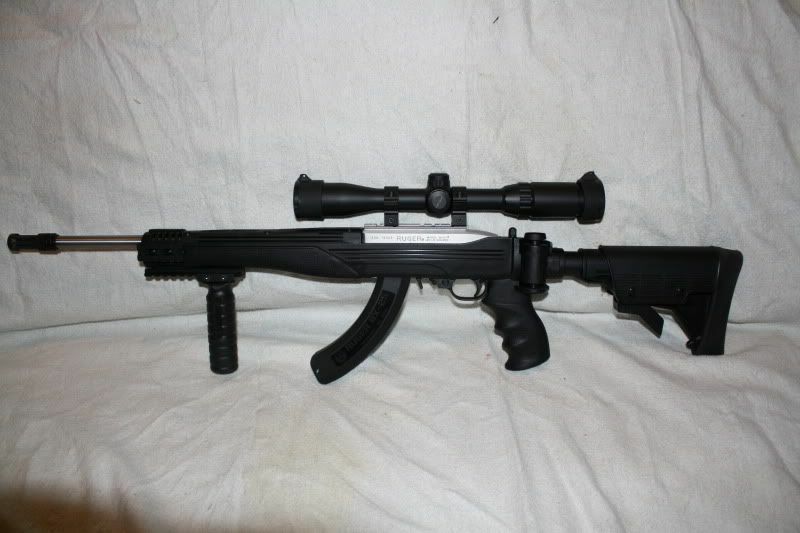 look on gunbroker.com search for I-Tac. it does draw a lot of attention at the range. made it to the range today. put 200 rounds down range. it shot really nice. gotta get used to the sights. the guy in the next bay over wondered about it, gave him the info and he was surprised at the low cost to buy it. I let him shoot a couple times and he was really impressed. as always, can't wait to get back to the range.. I found this picture from last year. 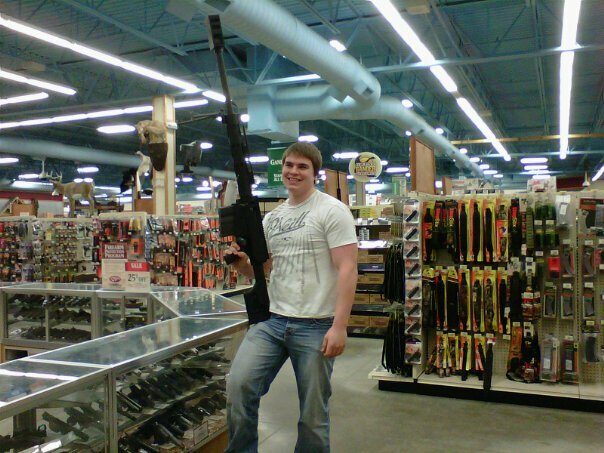 I was around 6'2 230 in this picture so this gun is massive. Bushmaster .50 cal.